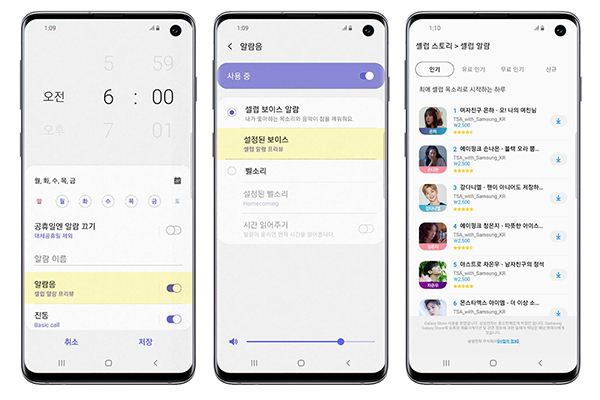 Samsung Galaxy users can now wake up in the morning to the voice of their favorite celebrities. Samsung Electronics Co. said Wednesday it will expand its “Celeb Alarm” service beyond Galaxy S10 to a broader range of models including the Galaxy S9 series, Galaxy Note 8 and 9, Galaxy Note FE and the Galaxy A8. The app currently hosts the voices of 10 K-pop celebrities but is set to add more in the coming months. For now, the list includes Kang Daniel and Park Ji-hoon of the now-disbanded boy group Wanna One, Jung Eun-ji and Son Na-eun of the girl group Apink, and Cha Eun-woo of the boy band Astro. The app is available at the Galaxy store, with the 90-day subscription priced at 2,500 won ($2.20). The smartphone has to be updated to the latest Android 9.0 Pie and the clock app also set to the most recent version. The service was launched in 10 countries across Asia, including China, Japan, Thailand, Vietnam, Malaysia and Indonesia.